The largest Easter Egg hunt on the Gulf Coast, featuring more than 50,000 eggs, awaits children on April 20 for the popular, annual Egga-Wahooza event at the Vince J. Whibbs Sr. Community Maritime Park. The Pensacola Blue Wahoos, along with Marcus Pointe Baptist Church, Cat Country 98.7, Encore Productions, and Play Pensacola, are once again teaming to provide this fun, family event. Children ranging from infants able to walk, all the way to 5th grade age, are welcome. Egga-Wahooza will be from 10 AM to noon. Colorful Easter Eggs will be placed across the spacious grounds of the Community Maritime Park. Children will be able to hunt and find eggs in a safe, grassy acreage which fronts Blue Wahoos Stadium. Members of the Blue Wahoos staff will be on hand to help greet and assist with the event. At 10 AM, children with special needs and children ages 1-4 will hunt for eggs. At 11 AM, kindergarten-5th graders will participate in the egg hunt. Kazoo will be there, too! 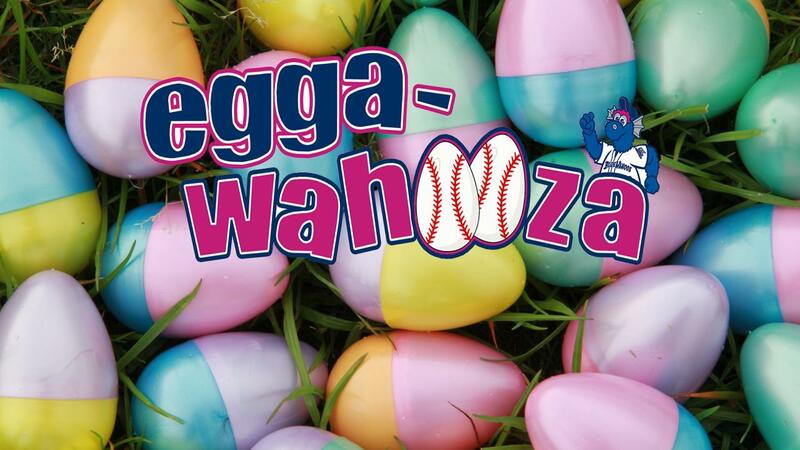 Kids will get their chance to find eggs with the popular Blue Wahoos mascot encouraging them. For more information, please visit www.pensacolachurch.org to pre-register your child and ensure a speedy process on April 20.